have elected MISS IMPOSSIBLE by Émilie Deleuze (France) as the winner of the European Film Academy Young Audience Award 2016. As a response to the current situation in Europe and a contribution to integration, this fifth edition of the EFA Young Audience Award also specifically included refugee kids. It was the first time that Berlin participated in the initiative and it was here that the European Film Academy and the Academy of Arts brought together Berlin pupils and “welcome classes” for refugee children. Together they watched the nominated films, discussed them with each other, and, as members of the pan-European jury, voted for the winner. This special event was organised in co-operation with the Berlin Akademie der Künste (Academy of Arts) and supported by the Federal Agency for Civic Education and include kids from Germany and from: Afghanistan, Albania, Belarus, Bosnia & Herzegovina, Bulgaria, Cameroon, France, Iraq, Italy, Kosovo, Latvia, Libya, Palestine, Poland, Syria, Thailand and Turkey. Having watched the three nominated films on Young Audience Film Day, 1,400 young cinema-lovers across Europe had the opportunity to discuss the films before electing their favourite. The results were then reported live via video conference to Erfurt (Germany) where German TV host Felix Seibert-Daiker moderated the awards ceremony. The ceremony was transmitted online as a live stream and will remain available as VOD. EFA Director Marion Döring presented the award to the director Émilie Deleuze who thanked the audience and, above all, her main actress Léna Magnien. Main actress Lena Magnien interviews director Emilie Deleuze about the idea for the film and how it was to make it. Three smart young actors translate. The film's directors Baris Kaya & Soner Caner talk about the film which started with a book by Soner Caner. Together, they turned it into a script and started shooting. Find out more about the story and how it was to work with the main actor, 9-year-old Alen Hüseyin Gürsoy. Congrats to THE INVISIBLE BOY and a big thank you to all three nominees and the kids who participated across Europe! Sanna Lenken talks about her film MY SKINNY SISTER, about eating disorders like anorexia and how they have an impact on the whole family and wanting to make a fiction film about it. She remembers how long they had to search to find the young actress Rebecka Josephson. And she talks about figure skating and how they invented a special construction for filming on ice. Italian director Gabriele Salvatores talks about his film THE INVISIBLE BOY, that he wanted to make a film about a 13-year-old European superhero and how he wanted to be invisible as a teenager (particularly for the girls). Gabriele learned filmmaking by simply making films and he still enjoys working with amateurs. Dublin-based director Mark Noonan talks about his film YOU'RE UGLY TOO, how he got the idea for the film, about his first short QUESTIONS and finding out that he likes the combination of tragedy and humour, and about working with the young actress Lauren Kinsella. In a truly European vote, 12-14-year-old audiences in Aalborg (Denmark), Barcelona (Spain), Belgrade (Serbia), Bratislava (Slovakia), Budapest (Hungary), Cluj-Napoca (Romania), Erfurt (Germany), Izola (Slovenia), London (UK), Prizren (Kosovo), Riga (Latvia), Sofia (Bulgaria), Stockholm (Sweden), Tbilisi (Georgia), Tel Aviv (Israel), Valletta (Malta) and Wroclaw (Poland) elected REGRET! (Spijt!) by Dave Schram (the Netherlands) as the winner of the European Film Academy Young Audience Award 2014. Having watched the three nominated films on today’s Young Audience Film Day, the young cinema-lovers across Europe had the opportunity to discuss the films before electing their favourite. 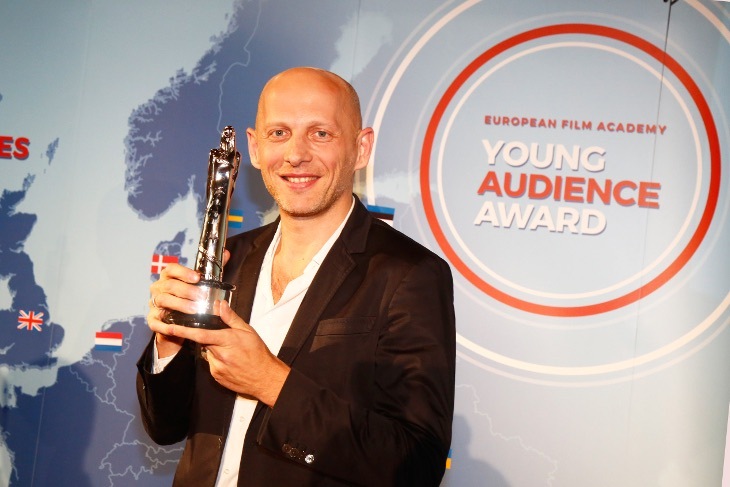 The results were then reported live via video conference to Erfurt (Germany) where Polish actor Maciej Stuhr moderated the awards ceremony transmitted online as a live stream. The German jury speakers Emma and Elias presented the award to director Dave Schram who thanked the audience and expressed his hope that the film may help to do something against bullying. Katja von Garnier, the director of WINDSTORM, talks about her start in filmmaking, the making of the film, working with kids (and horses) and her love for horses. Dave Schram, the director of REGRET!, talks about the making of the film, working with kids and the problem of bullying at school. In the second edition of the Young Audience Award, 12-14-year-old audiences in Copenhagen (Denmark), Erfurt (Germany), Izola (Slovenia), London (UK), Riga (Latvia), Sofia (Bulgaria), Turin (Italy), Valletta (Malta) and Wroclaw (Poland) elected THE ZIGZAG KID by Vincent Bal (the Netherlands) as the winner of the European Film Academy Young Audience Award 2013. Having watched the three nominated films on Young Audience Film Day, more than 600 young cinema-lovers across Europe had the opportunity to discuss the films before electing their favourite. The results were then reported live via Skype video conference to Erfurt (Germany) where German TV host and entertainer Ben moderated the awards ceremony transmitted online as a live stream. 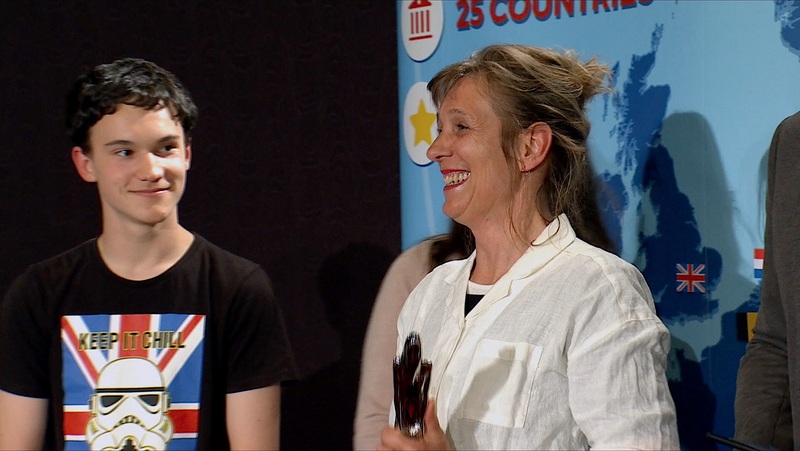 The German jury speakers Lisa (14) and Neal (13) presented the award to director Vincent Bal who thanked the juries in all cities, everybody who worked on the film, his family and especially his children. Bernd Sahling, the director of UPSIDEdown, talks about his film and the true story it is based on. The story of a ten year old boy who cannot read and write, the medication he had to take to help him concentrate and his love for riding his bike. The director explains why he decided to make a film about him. Check it out! Patrice Leconte, the director of THE SUICIDE SHOP, talks about his animation feature and Jean Teulé’s novel it is based on. The director explains what he liked about this dark and funny book that was considered to be impossible to adapt for the screen and why he decided to do it anyway. And you can watch him in the sound studio working with the actors. Vincent Bal, the director of THE ZIGZAG KID, talks about his film based on the novel by David Grossman of a boy trying to find out who his mother was. The filmmaker reveals how he found the perfect boy to play the main character. And he explains how his life-long love for comics and Super-8 films influenced and helped him making THE ZIGZAG KID. Watch how a scene develops from his storyboards to the actual film! In a truly European vote, 10-13-year-old audiences in Amsterdam, Belgrade, Copenhagen, Erfurt, Norrköping and Turin have elected KAUWBOY by Boudewijn Koole as the winner of the first European Film Academy Young Audience Award.